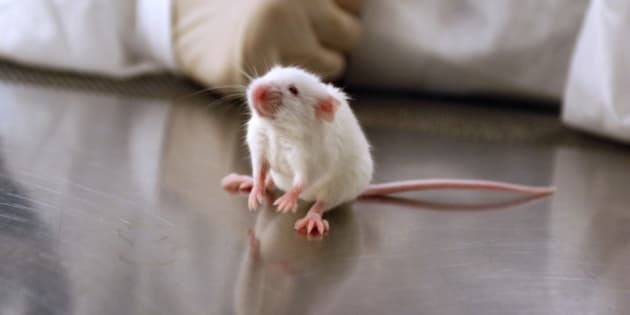 A lab mouse in a laboratory. The company at the centre of a controversy over conditions at a long-term care home in southern Alberta says its investigation has shown a disabled resident with dementia was not bitten by a mouse. Covenant Health says its officials spoke with care staff at St. Therese Villa, reviewed documentation and consulted a doctor. The company says while a mouse was sighted in the woman's room, there is no evidence a mouse was ever near her. The company also says a doctor has concluded her wounds were not caused by an animal bite but by a viral condition. Alberta Health Minister Fred Horne ordered an investigation into a complaint that mice were found nibbling on the face of the woman, whose disabilities would have prevented her from moving the mice away. Horne said Tuesday the probe will be conducted under the Protection for Persons in Care Act, along with a review into whether health standards were breached at the Lethbridge facility. "I'm extremely angry about this," he told reporters outside his office. "This is completely unacceptable. It's intolerable in this province or any other province, and we will get to the bottom of it." A health-care advocacy group called Friends of Medicare brought forward the allegations that staff at St. Therese Villa found mice on the face of the patient on Sept. 1. Executive director Sandra Azocar said a nest of mice was later found in the woman's closet. Azocar said the woman has been given medication to prevent infection and is also suffering emotionally. Covenant Health CEO Patrick Dumelie said in a news release that he is confident in the results of the medical review which concluded appropriate care and treatment were provided. "We can understand how the public would be alarmed at a story like the one that was circulated yesterday," he said. "We are also concerned for the distress these allegations have caused our families and residents and our staff who provide incredible care." He said Covenant Health is working with Alberta Health Services to deal with any environmental concerns and is cleaning areas thoroughly. He said pest control has been augmented at St. Therese Villa and the site will continue to use every precaution to prevent mice entering the facilities. He said Covenant Health welcomes anyone who has concerns to bring them forward to administration or nursing staff. "Our priority is the safety and health of residents," said Dumelie. "It is very unfortunate when these kinds of allegations are circulated in the public without proper evidence or facts." On Monday, Azocar said staff at the care home first complained about mice a year ago and they have also been fighting a bed bug infestation. Horne said he was concerned at the allegation that staff concerns at St. Therese staff might not have been heard by management. "My hope is that by ordering this investigation it will make it clear to everyone that we want the information, that people are free to tell their story, that they actually be encouraged to bring their concerns forward." Kerry Towle, seniors critic with the Opposition Wildrose, said the government needs to do more and should appoint an independent seniors advocate. Wildrose health critic Heather Forsyth called the controversy shocking. "No one should have to think that their personal safety and security is at risk when they go into care at a long-term care facility in our province," she said in a news release. "Quite frankly, it’s disgusting and we hope that the province and the facility start giving Albertans some answers immediately."